It’s summit day, and we did it! We already told everyone in a previous post – so no nail biting necessary as you read about our trials and issues getting up the mountain…and sorry, this is a long one. Our crew woke us up at 11:15 with tea and sugar cookies. Man, do they know what to feed you when. This was perfect right before the climb – quick sugar energy. At altitude, your body doesn’t really digest things (survival mode), so quick energy is best. Then, we put on all of our clothes, got out the headlamps, pumped each other up, and set off around midnight. I thought the dark would be scary, but it was beautiful. The stars are gorgeous!! Plus, it’s probably better that we can’t see how far we have to go. As we started to ascend, I saw three shooting stars. We’ll take that as a good sign. As we got closer, we started going more slowly and taking 5 small steps at a time before taking a break. Brad was really struggling with the altitude – it hit him worst of all. Michael, his guide, was phenomenal, even though Brad probably wanted to yell at him for making him keep climbing! It was freezing – below zero and with no sun at all to sort of warm you up, so if you stop and take a break, you are at serious risk of freezing to death. Poor guides had to force us to keep moving. Brad and I pushed each other up this mountain – the altitude wasn’t really affecting me terrible (no headache or breathing issues or nausea) so I kept trying to make sure Brad didn’t have some sort of edema. Honestly, your only focus at this point is survival. I read something later on that said “when you are climbing the summit, you belong to the mountain”. I can’t think of a better way to say it. Finally, I yelled (well, as much as I could) to Michael “how much longer”?? He said “about 5 minutes”. PHEW, best thing I’ve ever heard in my life. 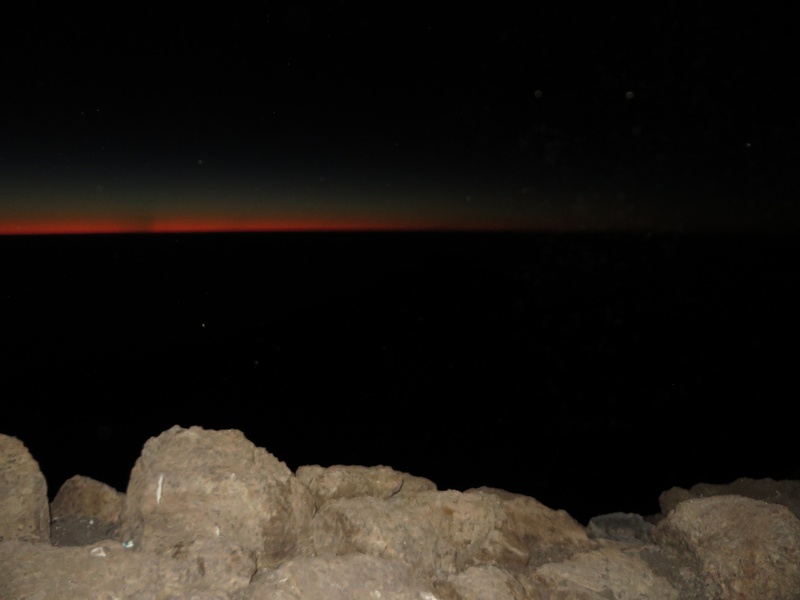 We climbed – at this point it’s huge boulders you are climbing through – and could start to see the sun coming up over Mawenzi. In Africa, because you’re on the equator, whenever the sun would come up or go down, it wasn’t a process. It comes up and brightens the sky in a few minutes; same with sunset. We were right on schedule. Then, Brad reached in to his backpack, pulled out a gorgeous ring, and proposed. It was short and sweet – perfect since we still couldn’t breath! We made it up this mountain because of each other :). Our guides LOVED it. Nick got a picture that he’ll share later. We celebrated for about 10 seconds, then headed to Uhuru. So, Gilman’s to Uhuru was supposed to be easier. Not the case. Still 1.5 hours around the crater rim. It’s gorgeous – sun’s out and you can see the clouds forever – but it’s a tough hike. This is when we thought Brad would need to turn around and go back down. The altitude was at it’s worst. Michael pushed him along…and Nick and Protas were way ahead at this point :). We knew Brad could do it, but he felt so weak. Then, the vomit monster visited Brad and he threw up. A lot. Michael goes “Good. Vomit makes you stronger”. And it was true! He felt great afterwards. We headed up to Uhuru and made it right on schedule – behind a group of people with a VERY large cross. I have no idea how they climbed with that. We took pictures at the top, celebrated, and looked at the most beautiful view we’ve ever seen. 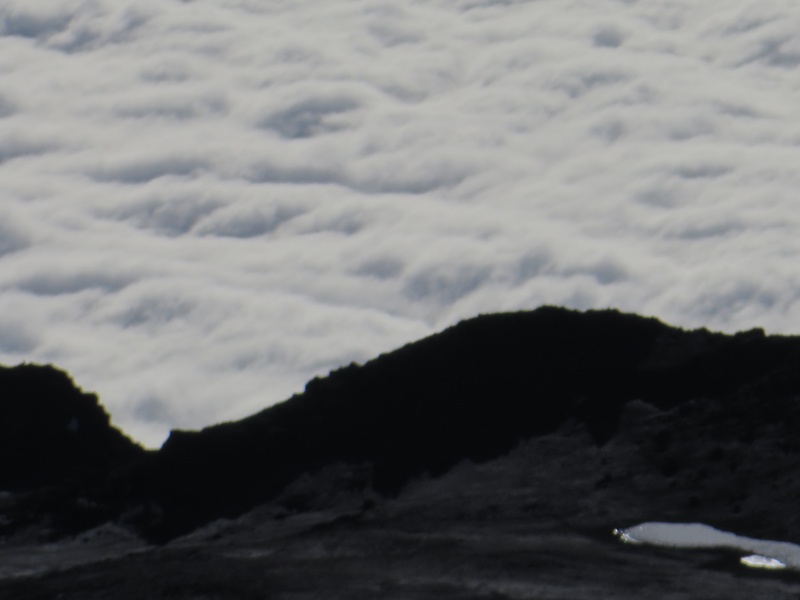 You can see Mawenzi, tops of clouds, glaciers, the volcanic crater, and way down to the towns. We had reached the roof of Africa. The engagement high certainly helped :). Don’t discount the fact that we still had to climb down and make it to Horombo – 7,000 feet below. Michael knew Brad didn’t feel well, so he grabbed him and forced him to run down the summit. Dust was flying everywhere, but he got Brad down safely to Kibo in an hour! I feel bad for yelling “watch out for the ACL tear! !” Man, Michael is amazing. He also climbed without a headlamp. OMG. 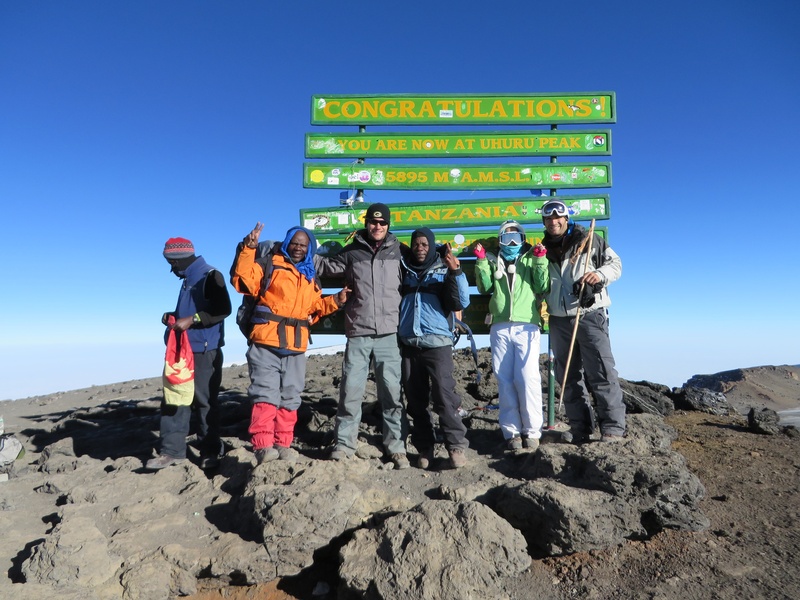 We arrived at Kibo, our crew dusted us off, we took a short nap and had lunch. Reapplied sunscreen since the sun is blazing up there, then headed to Horombo. 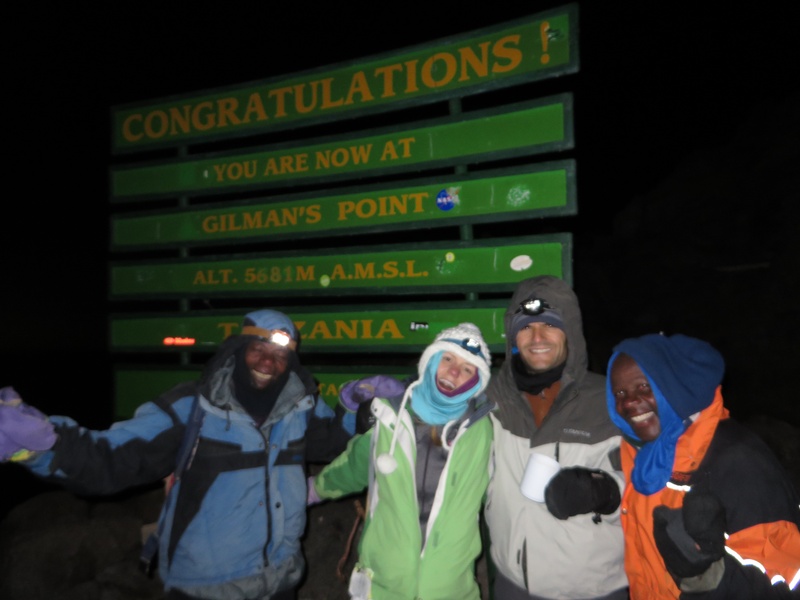 Pole pole – but oh man did we want to go not pole pole so we could get to Horombo and sleep! Many people back at Kibo had not made it to the top, sadly. We made it to Horombo around 4pm, after seeing our British friends hiking up to Kibo! So, we’ve been hiking for 16 hours at this point! We cleaned up, ate a delicious dinner, and met a cute french couple on their honeymoon! They found out we were engaged and celebrated with us. A perfect engagement celebration with some wonderful strangers :). Then, time for bed at 7pm. 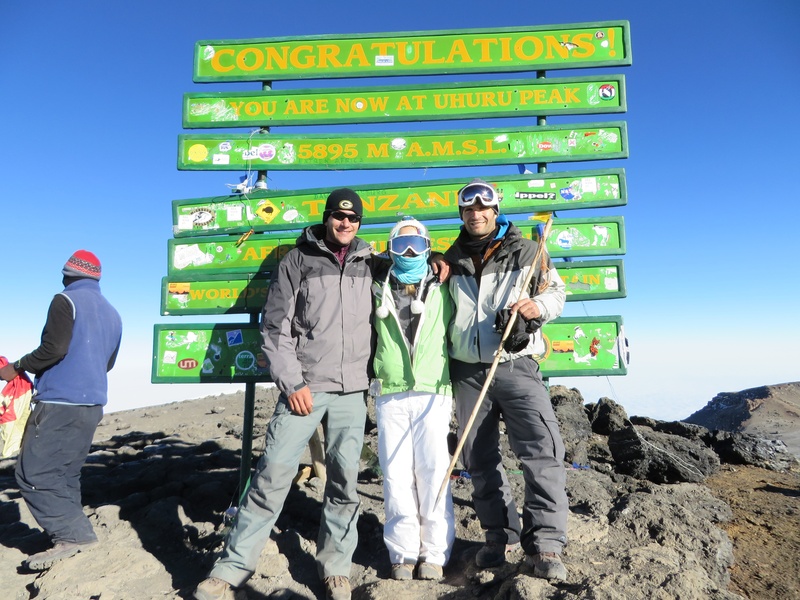 The most amazing day of our lives – other climbers, push through. Trust your guides – it’s worth it! Sidenote – sleep with your camera batteries in your sleeping bag. Nick’s died at Gilman’s!! Luckily mine worked and I had a disposable just in case. But batteries hate cold. Tomorrow we get to the bottom. Also – best place in the world to get engaged? 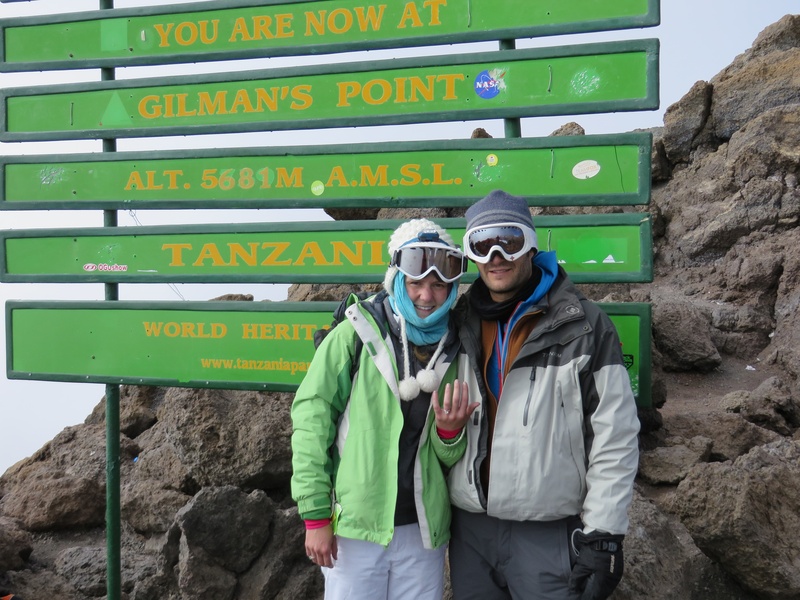 Top of Kili.